Morale is down-spirits are low-the workload is mounting. Today's hard-working employees need a break! 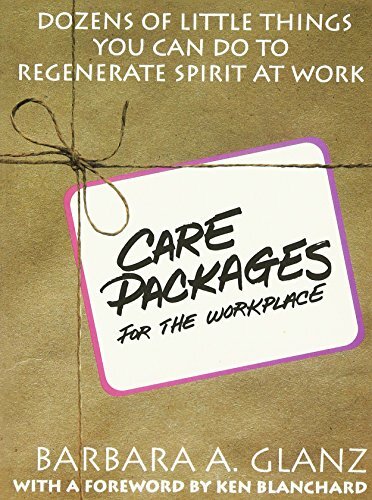 And nothing feels better than Care Packages for the Workplace from internationally known, lift-your-spirits author Barbara Glanz. This timely gift-book format provides the hard at work with dozens of simple "brighten-your-day" ideas such as: beautifying the work space in order to do what Tom Peters recommends-"Fight Bland Dullness! "; putting a personal signature on all work; sharing a joke-a-day, one month at a time; holding grapevine meetings where rumors are openly discussed; partaking in good news hours where positive news is shared; creating special awards for a job well done; scheduling lunches with management.